Subtitling is defined as adding subtitles to a movie, program or video. Subtitling translation is adding subtitles which translate into a foreign language what the actors or the narrator says. It is an activity that requires understanding the audience, its culture and local sensibilities, to fully convey the original message in a way that sounds natural to them. Whether you are looking for a professional Youtube video translation, movie subtitling translation or subtitling service for institutional advertising, Web Media Translations has language professionals who fully understand the cultural and idiomatic differences in all French-, Spanish- and English-speaking countries. Subtitling translations are normally calculated per minute. This allows to quickly determine the cost of a subtitling service. All rates are the same independent of the languages involved or whether it is a movie subtitling translation or translation of any other type of video content. This means that a 90-minute movie, a standard for many movies, costs $540. Most movies are about 90 minutes long. Some have a lot of dialog, some others less dialog. However, in general terms, a 90-minute movie is usually delivered within 4-6 working days. This implies that the average delivery time is 15 minutes/day. This delivery time includes not only the translation of the audio but also its adaptation to the audience and country where the movie or video will be shown. Subtitling translation is generally done using a transcript or screenplay of the dialog or commentary in movies and videos. If no transcript or screenplay is available, the translation must be done directly from the audio. Both ways are acceptable and depend on whether a transcript is available or not. Subtitles are delivered either in text (.pdf, .doc, .txt, etc.) or.srt format, a widely used subtitle text file format that can be easily added to Youtube videos and which is compatible with most software video players. In case subtitles are preferred in .srt format, 1 or 2 additional business days are usually advised to fully synchronize the subtitles with the video. This allows you to obtain a high quality translation that is also perfectly synchronized with your video. Subtitles are normally delivered in .srt or text format so that you can easily add them to your movie or video using tools such as those in Youtube's video manager or other professional video editors. If you require us to modify your video and export a version with subtitles, this process is normally regarded as an additional step to subtitling translation and requires us to amend your quote depending on the length of the movie/video. Web Media Translations is a division of Munduslingua.com, a company with several years' experience in the translation of web and media contents. If you are looking for a company to provide you with subtitling translations for movies and videos, do not hesitate to contact us. 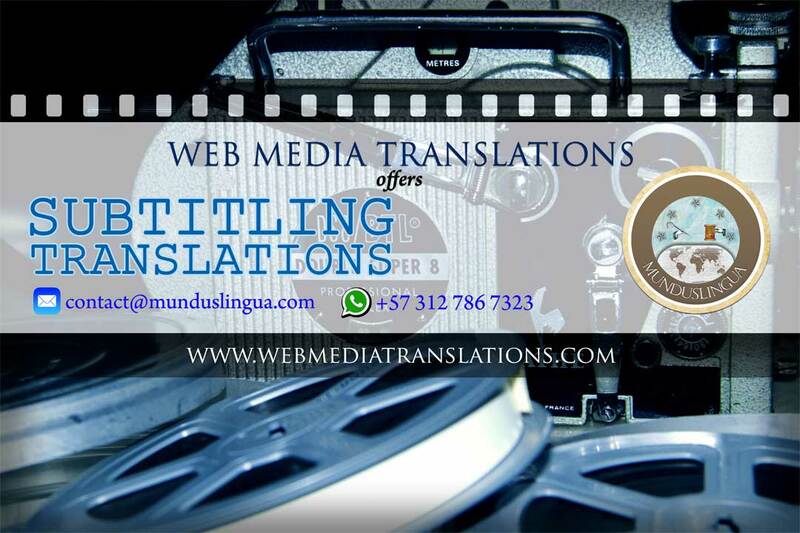 Web Media Translations is a division of Munduslingua S.A.